The first segment is the pre-production. Every project starts with a script or a synopsis. You will also see the term screenplay. A script is the written version of a project done by a screenwriter. You will encounter a script in many different types of projects such as movies, television series, video games and advertisements. It is the source for all the upcoming steps. 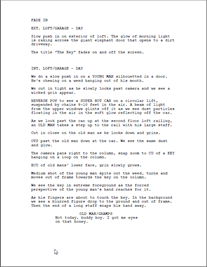 A script usually contains the storyline, location descriptions, actions, dialogue, sound effects, etc. It contains all the information necessary for the artists to illustrate and animate the movie or series. The script is needed in order to transform the project into a storyboard. This same script is used as a dialogue for the audio recording. Finally, characters, props and locations will be designed from all of the descriptions contained in the script. The storyboard, which is created by the storyboard artist from the script, is also common to all types of projects. A storyboard is a visual representation of all the scenes and actions contained in the script. The dialogue, backgrounds, action notes, and characters are included. 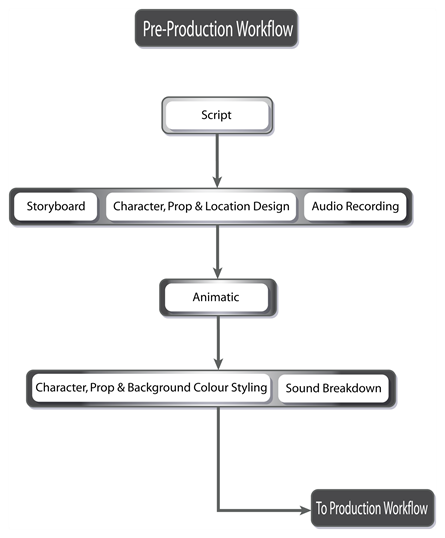 The storyboard is often created at the same time as the characters, props, location design and audio recording. The first storyboard is not always exact, as the designs are subject to many changes during the beginning of a production. The storyboard is essential to the layout and posing, and the animatic. This step is not done with Harmony. Traditionally, the storyboard is created on paper. This step can also be achieved with Toon Boom Storyboard Pro, software developed specifically for this use. Toon Boom Storyboard Pro projects can be imported into Harmony. Once the script is completed, the designer can start work. Before any animation, background or colouration can be done, the design needs to be addressed. The artist has to decide on the production style, the character's look, the location's complexity, and so on. Once these designs are done and approved, the model pack is produced, containing all of the models for all these aspects. The designs and models will be used by the colour stylist and layout artist, and finally by the animator. The audio recording is also called voice recording. The script is needed for dialogue and extra sound effects. The actors will read the lines from the script and record their dialogue. These voices will be used later on for the animatic, the animation and the final production compositing. The animatic, also known as leica, comes directly from the storyboard. 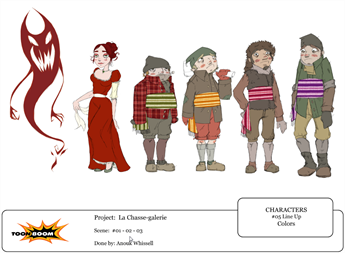 The animatic is the first movie of a project and is used to help the animators and compositors. The storyboard is scanned in and mounted with the sounds and dialogue. There is no animation yet. It is simply the storyboard frames changing over time to help evaluate the rhythm and the look of the show. This will help avoid mistakes that would have been found only at the end of a show. This step is unnecessary if you are absolutely sure of your storyboard and timing, but an animatic is always recommended. This step is not done with Harmony. Generally, an external software is used to do the storyboard editing to create the animatic. This step can be achieved with Toon Boom Storyboard Pro software which was developed specifically for this purpose. Once the black and white designs are done, they are sent to colour styling. The colour stylist chooses the colours and ambiance for the production and balances the characters, props and effects with the location palettes. This contributes to an even feeling or an emotional contrast where needed in the show. When the colours are approved, colour models are produced and backgrounds are painted. Colour models will often be added to the model pack. The colour models will be used by the colourists and the coloured background will be sent for compositing. For the dialogue, a sound breakdown can be done. This means that the sound will be broken down in small pieces and written on the traditional exposure sheet for the animator to use. Each frame will have its own bit of sound information which tells the animator what mouth phoneme to place on the character on a particular image. For digital cut-out and paperless animation, the traditional sound breakdown is not necessary as there are different tools inside Harmony to help the animator achieve the same result.